Light pink, with dark pink spots. Prefers shade or part-shade Height: 12-22 inches. Hardy in zones 7-10. Elsewhere dig and store in the winter. #1 size roots. Light pink, with dark pink spots. Fancy leafed Caladiums are very showy foliage plants with bright red, pink, green and white variegated leaves. 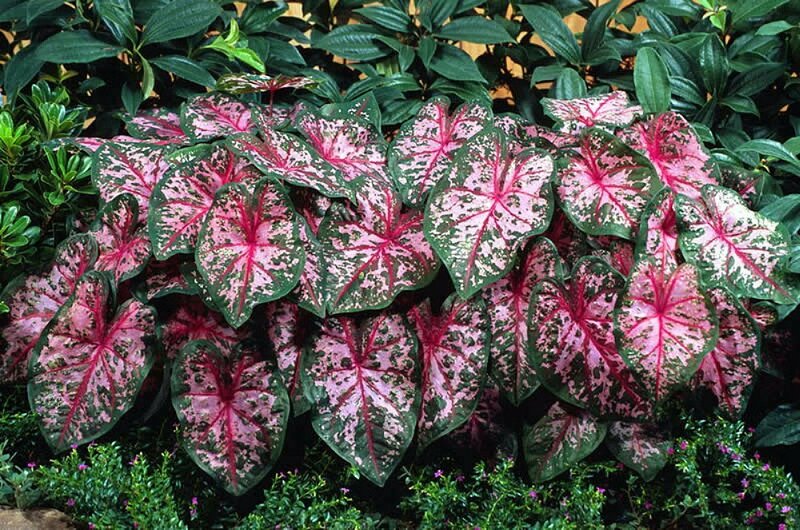 You'll enjoy these South American beauties with heart shaped, rainbow colored leaves...prettier than most flowers. Pot early indoors with a starting temperature of 70 F or more, then plant them, pot and all, outdoors in the shade or semi-shade after spring frosts. Or, plant them in shady window boxes where sun loving annuals won't grow. Water well and spray leaves frequently during hot, dry weather. Excelllent for conservatory or warm sun porch during winter.